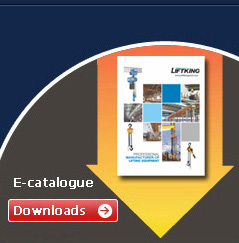 Liftking brand Manual hoist suitable for factories, mines, construction sites, docks, transport and other occasions. It is an ideal equipment in installing the machine,lifting the cargos, fixing the objects, lashing and traction. Especially in traction at any angle and in a small venue, open air and non-power supply condition even show its superiority. Lever hoist is kind of portable and versatile hand-operated loading and pulling appliance, which is capable of being applied in electricity, mines, ship-building, construction sites, transports and telecommunication for installing equipment, lifting goods, pulling mechanical parts, bulk stapping and fastening, tightening fittings of wires, assembling and welding etc. It has exceptional advantages particularly for pulling in every limited narrow place in the upper air high above the ground and at any angles. 4. 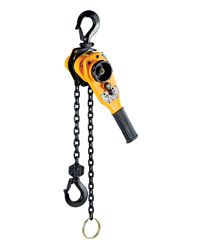 Lever block is a kind of highly efficient and versatile hand operated hoisting appliance. 5.It is particularly used in the narrow places, the open air and overhead places for pulling and stretching work at any angle. 6.The lever block is safe, reliable and durable. 7.The lever block is of excellent performance, easy operation and convenience maintenance. 8.The lever block is of small volume, light weight and portable in size. 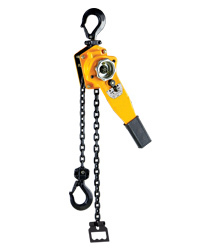 9.The lever block is of high efficiency, fast lifting and light hand pull.